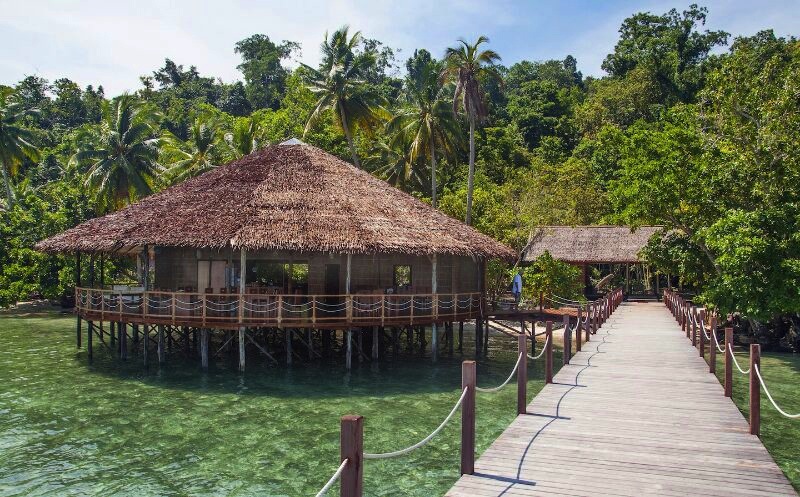 Papua Explorers Resort is located in the islands of Raja Ampat, which is on the northwest tip of the Bird’s Head Peninsula of West Papua. Raja Ampat translates into English as Four Kings and gets its name from a local mythology about four kings that occupy the four big islands; Salawati, Batanta, Waigeo and Misool. It’s a stunning archipelago comprising over 1,500 small islands, hosting thousands of species some of which are endemic to the region. Sun loungers to enjoy during your surface interval. 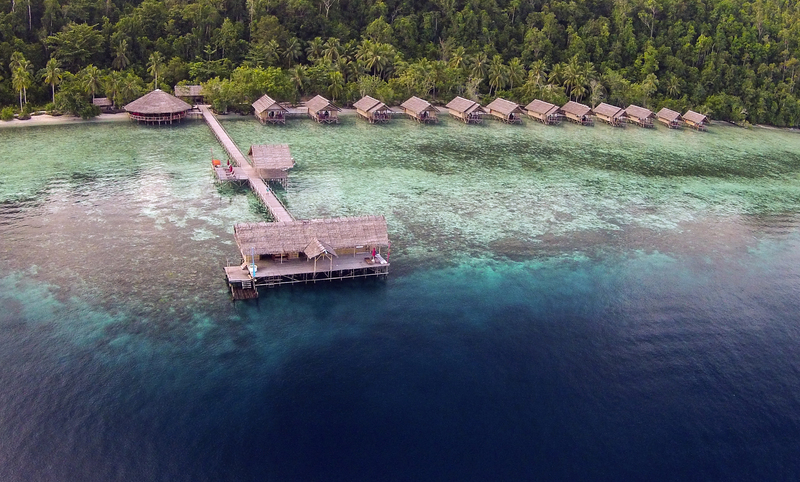 Raja Ampat Regency is a new regency which separated from Sorong Regency in 2004. It encompasses more than 40,000 km² of land and sea, which also contains Cenderawasih Bay, the largest marine national park in Indonesia. It is a part of the newly named West Papua (province) of Indonesia which was formerly Irian Jaya. History shows that Raja Ampat was once a part of Tidore Kingdom, an influential kingdom from Maluku. Yet, after the Dutch invaded Maluku, it was shortly claimed by the Netherlands. The main occupation for people around this area is fishing since the area is dominated by the sea. They live in a small colony of tribes that spreads around the area. Although traditional culture still strongly exists, they are very welcoming to visitors. Their religion is dominantly Christian. The beauty continues under the surface. 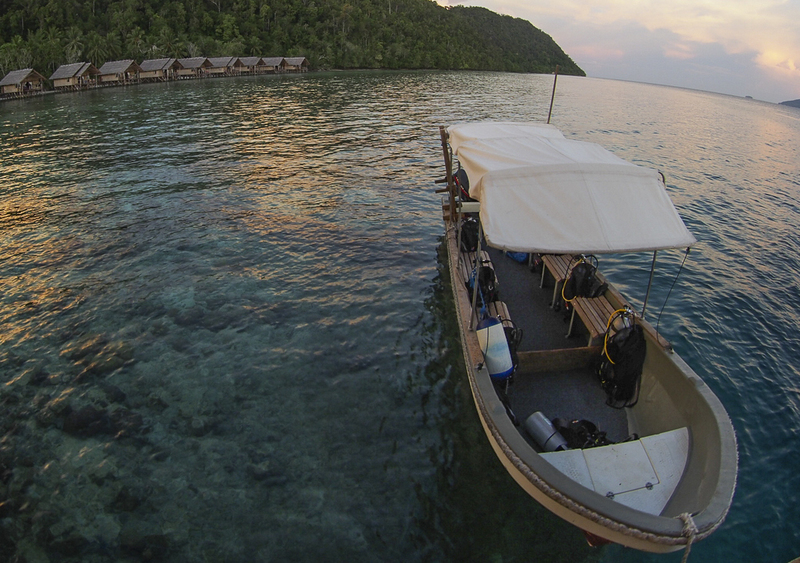 The oceanic natural resources around Raja Ampat give it significant potential as a tourist area. 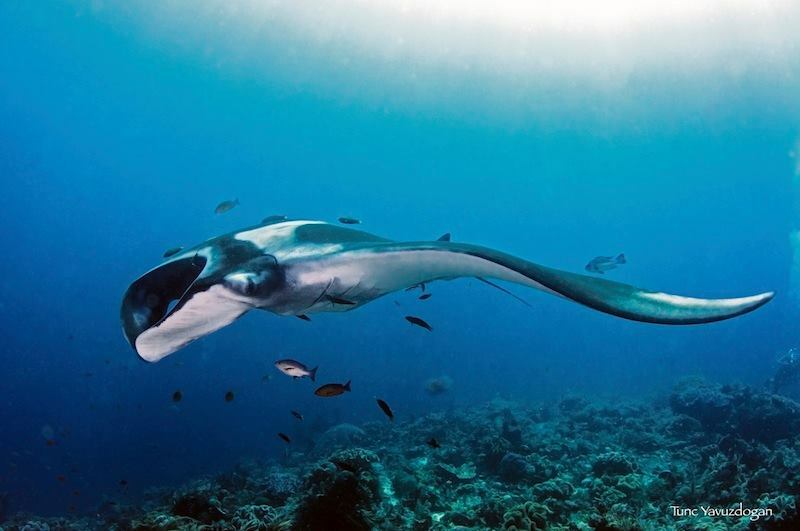 Many sources place Raja Ampat as one of their top ten most popular places for diving whilst it retains the number one ranking in terms of underwater biodiversity. 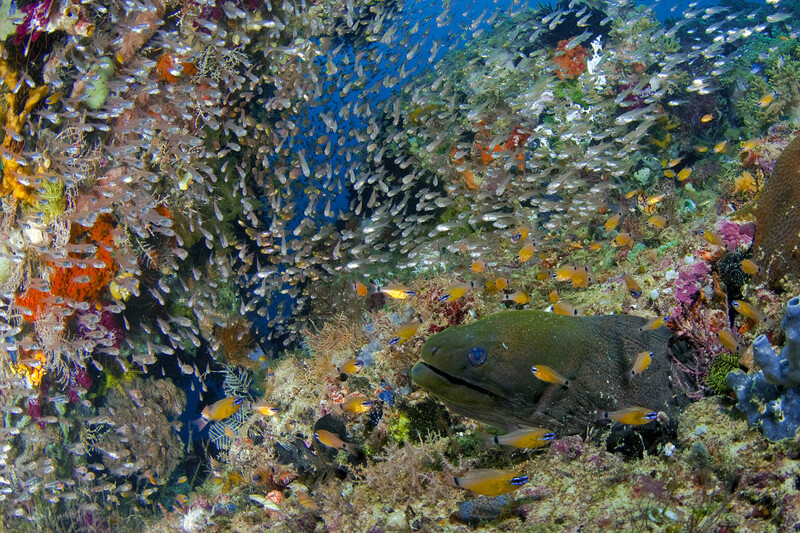 According to Conservation International, marine surveys suggest that the marine life diversity in the Raja Ampat area is the highest recorded on Earth.Diversity is considerably greater than any other area sampled in the Coral Triangle composed of Indonesia, Malaysia, Philippines,Papua New Guinea, Solomon Islands, and Timor-Leste. The Coral Triangle is the heart of the world’s coral reef biodiversity, making Raja Ampat quite possibly the richest coral reef ecosystems in the world.The area’s massive coral colonies along with relatively high sea surface temperatures, also suggest that its reefs may be relatively resistant to threats like coral bleaching and coral disease, which now jeopardize the survival of other coral ecosystems around the world. 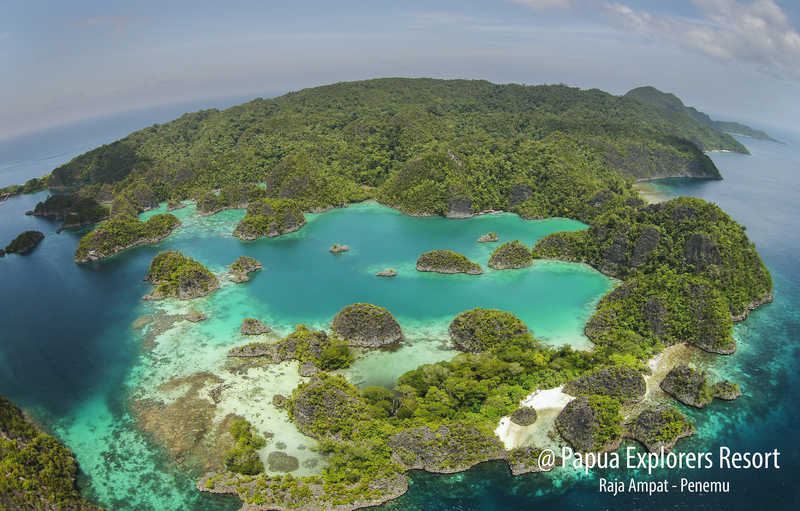 The Raja Ampat islands are remote and relatively undisturbed by humans. 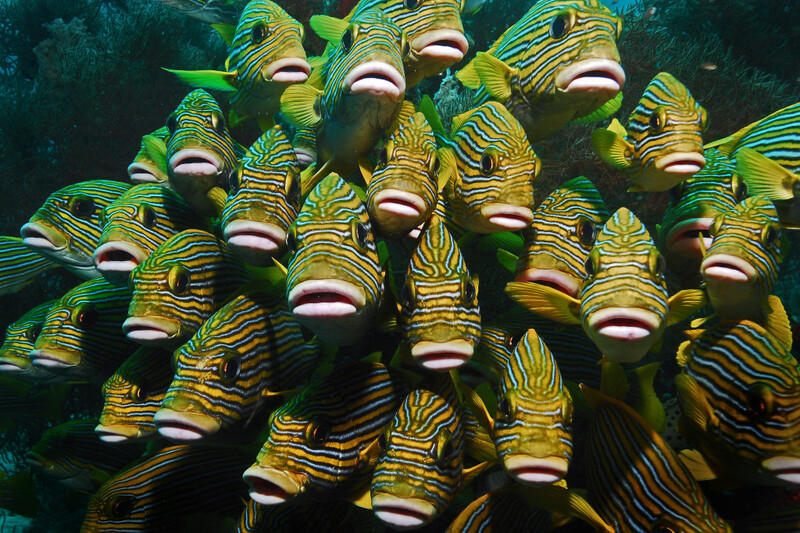 The high marine diversity in Raja Ampat is strongly influenced by its position between the Indian and Pacific Oceans, as coral and fish larvae are more easily shared between the two oceans. 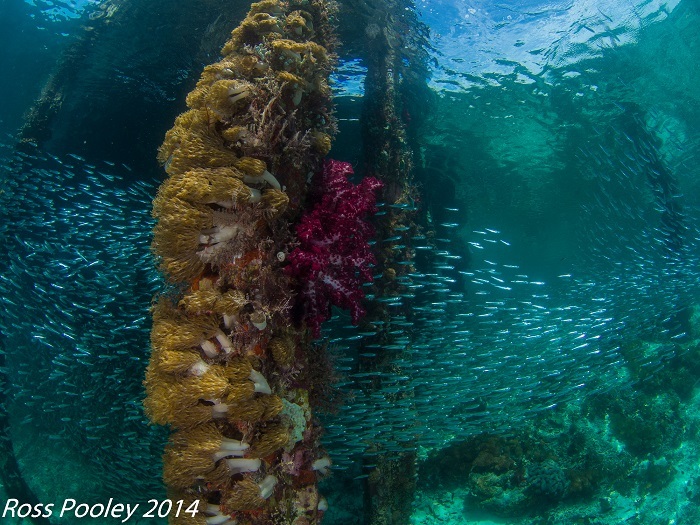 Raja Ampat’s coral diversity, resilience, and role as a source for larval dispersal make it a global priority for marine protection. 1,309 fish species, 537 coral species (a remarkable 96% of all scleractinia recorded from Indonesia are likely to occur in these islands and 75% of all species that exist in the world), and 699 mollusk species, the variety of marine life is staggering.Some areas boast enormous schools of fish and regular sightings of sharks, such as wobbegongs. You will never miss a sunrise or sunset with the unique, round shape of the restaurant. You can enjoy the beauty of the ocean and rainforest at the same time. You will taste examples of traditional Indonesian cuisine as well as international comfort foods out of the kitchen. 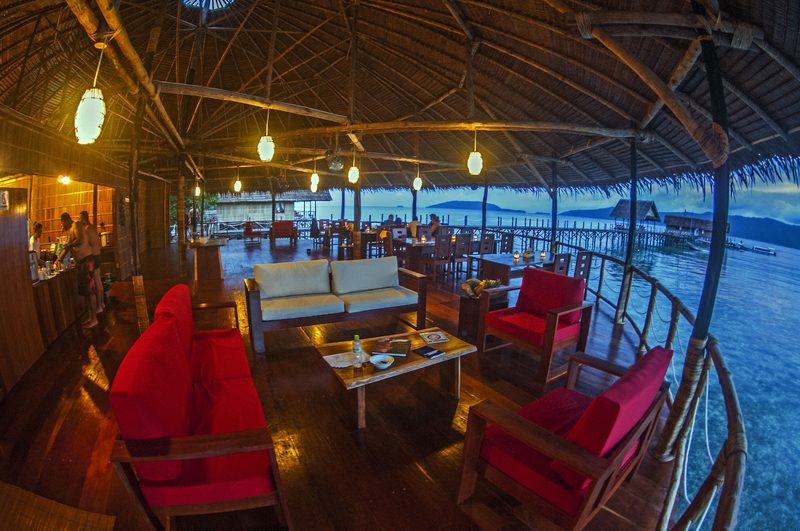 You can enjoy the snacks between dives and chill out in the lounge seating area after dinner. There is a computer for the use of all guests and complimentary wireless internet. 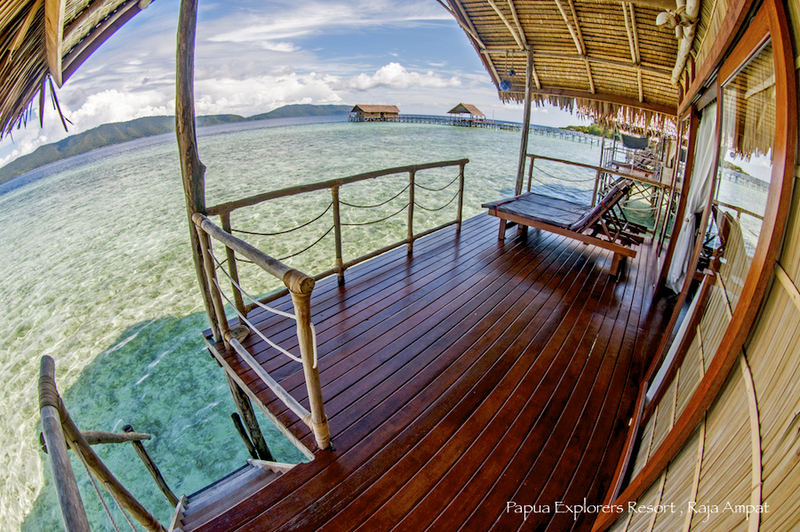 The Water-bungalows blend traditional Papuan style with the comfort of modern design features. 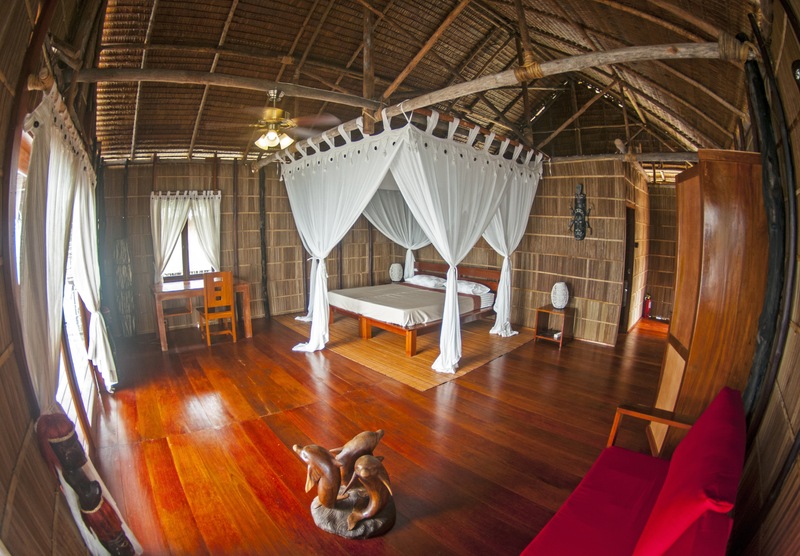 They are built by using local, natural materials collected from the surrounding villages. 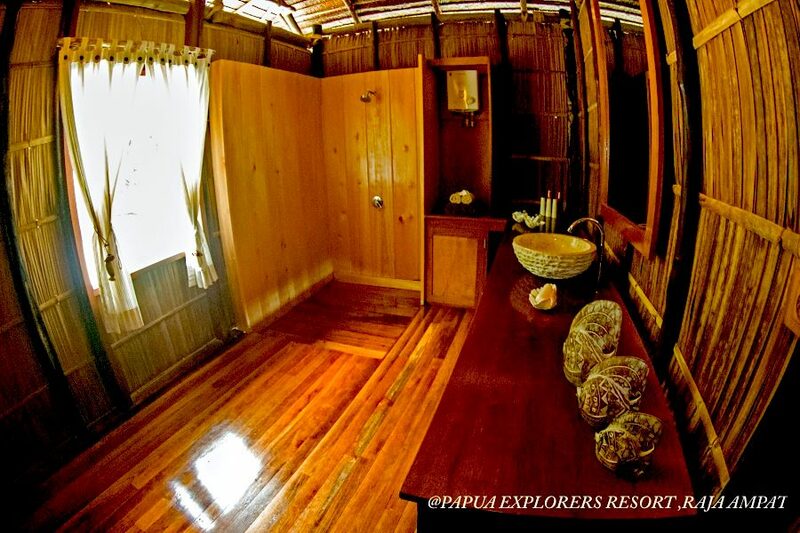 All bungalows are equipped with ensuite toilet and shower, hot water, ceiling fan, mosquito net, working desk and a comfortable seating area. The spacious veranda with direct access to the sea, allows guests to enjoy the sun and sea in their own privacy. Other features are ; 220 V electricity with European type plugs, in room tea and coffee facilities, drinking water, environmentally friendly and natural soap. 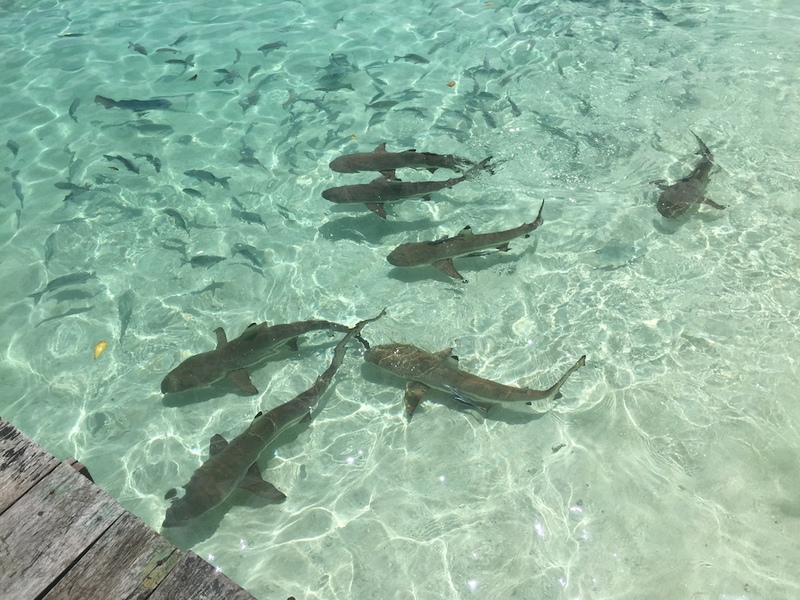 Juvenile black tip reef sharks. Manta Point: 20 min, Mike’s Point:10 min, Cape Kri:15min, Sardine Reef:25 min, Mioskon: 25 min, Blue Magic: 25 min, Otdima: 5 min, Chicken Reef: 20 min, Passage: 45 min, and Hidden Bay: 30 min. Even jetty dives are amazing. Raja Ampat waters are highly rich in nutrients and Dampier Strait is especially nutrient-rich due its fast moving currents. 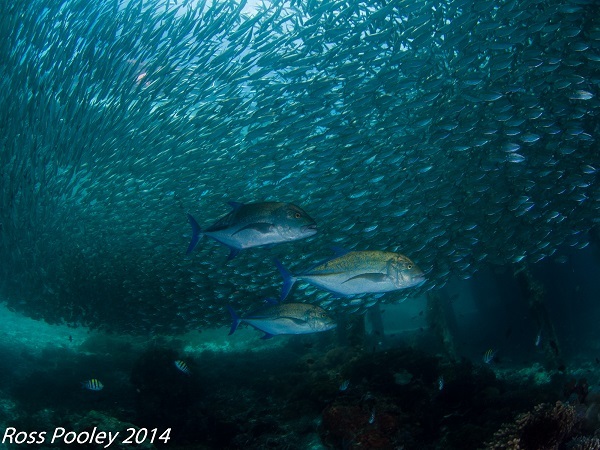 These currents attract a wide variety of species including migrating mammals and pelagic species. The dive center is a short stroll from your bed. The resort distribute reef hooks to all divers. 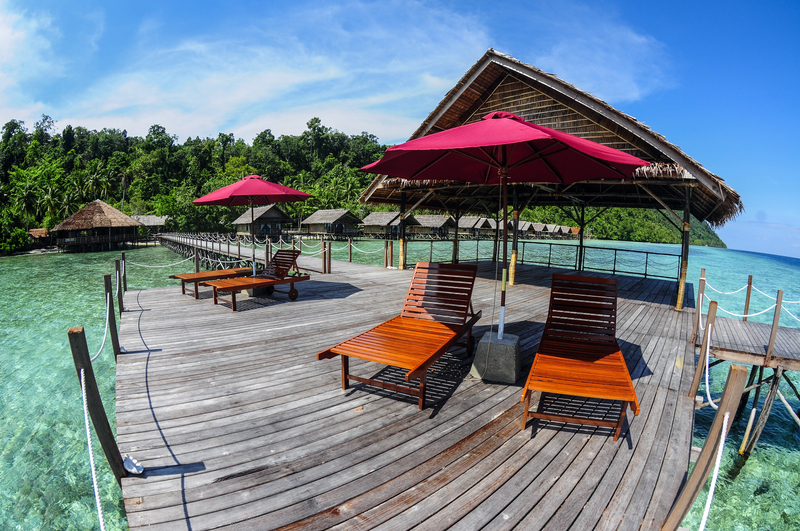 All divers are required to bring their safety buoys and whistles with them when coming to Papua Explorers resort. 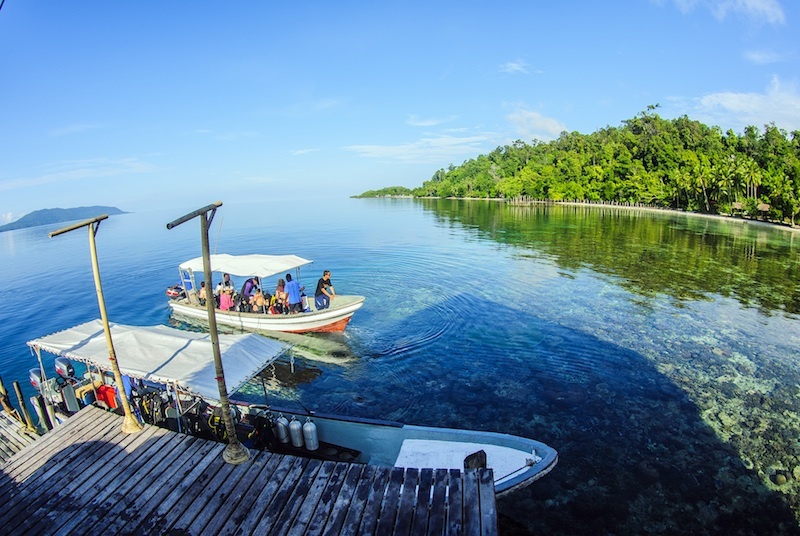 It is mandatory for all divers to have DAN insurance to be able to dive with Papua Explorers . The closest Hyperbaric chamber is in Waisai (45 min from the resort ) and has only recently opened. 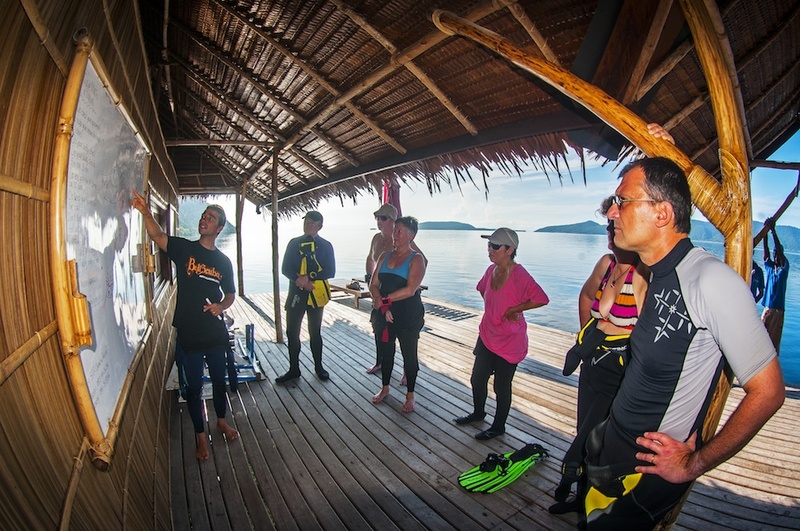 Please keep in mind that treatments can be extremely costly in case of an emergency.Therefore, all dives are planned and executed without deco stops and it is mandatory for all divers to use a dive computer The resort don’t have a huge stock of rental equipment because most divers prefer to bring their own equipment. So if you’d like to rent any equipment from the dive center, please book them 60 days in advance. 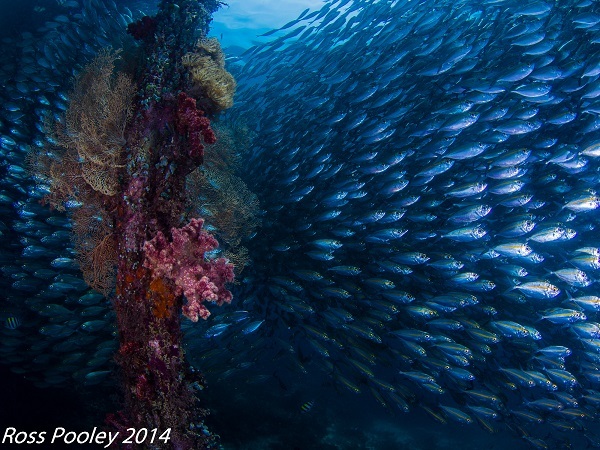 Raja Ampat is an underwater photographers haven for both macro and wide angle photography. Huge corals in vibrant colors are perfect for wide angle. Most photographers are mesmerized by the density of fish and corals and focus on wide angle photography throughout their stay. However, Raja Ampat is home to some endemic macro creatures and using your macro lens can be extremely rewarding. 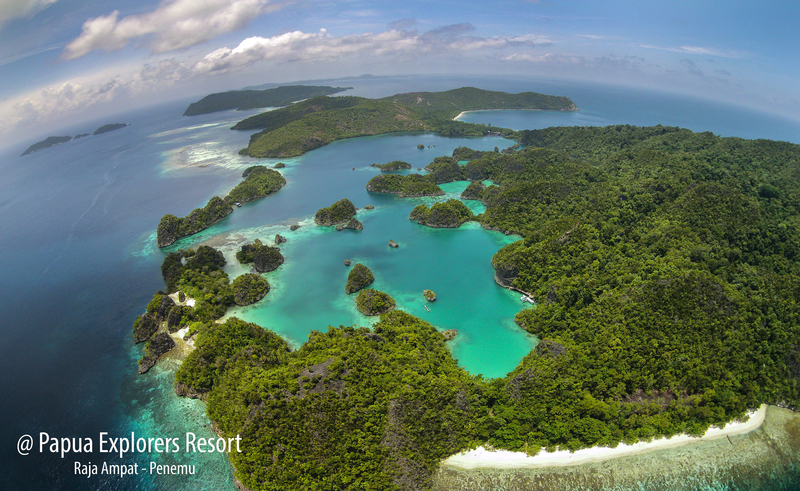 Raja Ampat is a birder’s paradise. Flocks of colorful parrots is a distinctive sight when you first arrive to the island. And after the first night’s deep sleep, you will be awakened by a chorus of tropical sounds. You will observe eagles above the resort or during your boat journeys. These are common, daily experiences. However, there is a lot more to birdwatching than that in Raja Ampat. 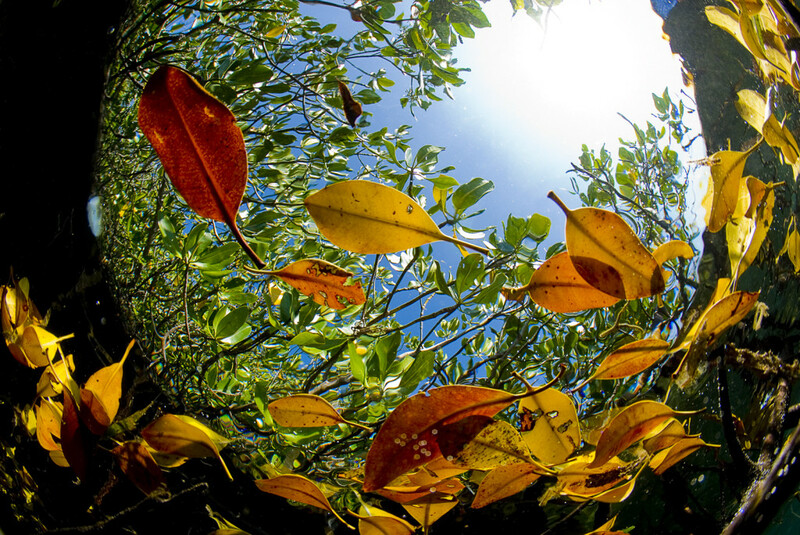 Raja Ampat islands are home to three endemics; Wilson’s Bird of Paradise, Waigeo Brush Turkey and the famous, crimson plumed Red Bird of Paradise. Other birding highlights include Western Crowned Pigeon, Pheasant Pigeon, Palm Cockatoo, Great-billed Parrot and Moluccan Red Lory. The Red Bird of Paradise lives up the hills of Yenwapnor village that is next to our Pinsilim Bay. It’s a 5 minute boat ride to the village from the resort. Male birds perform their famous courtship dances to attract females with the early lights of the day. Whether you’re a birder or not, this is a sight not to miss. For enthusiastic bird watchers, the resort arrange daily trips to Batanta Island to observe Wilson’s Bird of Paradise as well.